Te Rauparaha was the son of Werawera (Ngāti Toa) and his second wife Parekowhatu (Ngāti Raukawa). It is thought that he was born in late 1760s and was alive when Captain Cook visited New Zealand. It is believed that he was born at Kawhia or at his mother’s home of Maungatautari. He was a short man and was often called the Napoleon of the South as a testament to his fighting skills and short stature. His name is derived from an edible plant called rauparaha. After he was born, the chief who had killed and eaten his father, had threatened to eat him with the plant as an accompaniment. He was named Te Rauparaha in defiance of this statement. Although not of high rank, he rose to leadership of Ngāti Toa through his aggressive defence of his people and his prowess as a leader in battle. The arrival of firearms in New Zealand from 1819 allowed those tribes with access to firearms to assert their dominance over other neighbouring tribes and old adversaries. Te Rauparaha was quick to see the advantages to be gained in using the new weapons and participated with Tamati Waka Nene (a northern chief) in the musket wars in the far north. There was much inter-tribal warfare for dominance of Kawhia between Ngāti Toa and Waikato tribes. Te Rauparaha and his followers would eventually find themselves established at Kapiti Island, a large island off the coast of Wellington. Te Rauparaha was keen to control the supply of greenstone (pounamu) and other resources to be found in Te Waipounamu (South Island). He had the advantage over the southerners because they had not yet acquired guns (muskets) and he had reason to seek revenge on them as some of their chiefs had insulted him and fought against Ngāti Toa in earlier encounters. So in 1828, he sacked the Ngāti Kurī pā at Kaikōura and Ōmihi before heading to Kaiapoi, the large Ngāi Tahu settlement near the Ashley River north of Christchurch. A group of senior Ngāti Toa chiefs (including Te Pēhi Kupe) who accompanied Te Rauparaha entered the pā to trade and were killed. Te Rauparaha, who did not enter the pā, attacked, killing some Ngāi Tahu and then made his escape to Kapiti Island. He was back in 1830 when he carried out an elaborate plan to get revenge for the killing of the chiefs. He persuaded Captain Stewart of the brig Elizabeth to assist him with his plan.Tamaiharanui, the paramount chief of Ngāi Tahu at that time, on returning to Takapūneke (his homebase) was persuaded to board the vessel to trade and was captured and taken to Kapiti Island where he was tortured and killed. On the way to Kapiti Tamaiharanui strangled his daughter to prevent her enslavement and it is also reported that his wife Te Whe threw herself overboard, preferring death at her own hands to what awaited her at the hands of her captors. In 1831 Te Rauparaha again besieged Kaiapoi Pā digging trenches up to the walls and setting fire to the palisades. A change of wind assisted him to breach the walls and capture this important Ngāi Tahu pā. During the following summer season in 1832, Ōnawe pā on a peninsula in Akaroa harbour was besieged by Ngāti Toa and Ngāti Awa warriors camped on nearby tidal flats before gaining access and capturing the pā. This marked the final incursion of Te Rauparaha into the Ngāi Tahu territory. By 1833 Ngāi Tahu had acquired guns of their own and were able to resist his attempts to extend his territory in the South Island. He was nearly captured himself at Kapara-te-hau (Lake Grassmere) during the first of the expeditions to oust Ngāti Toa in 1833. During the next few years a number of expeditions took place led by fighting chiefs from further south, such as Tuhawaiki, Taiaroa, Haereroa and Makere, which brought to an end Te Rauparaha’s incursions into the south. 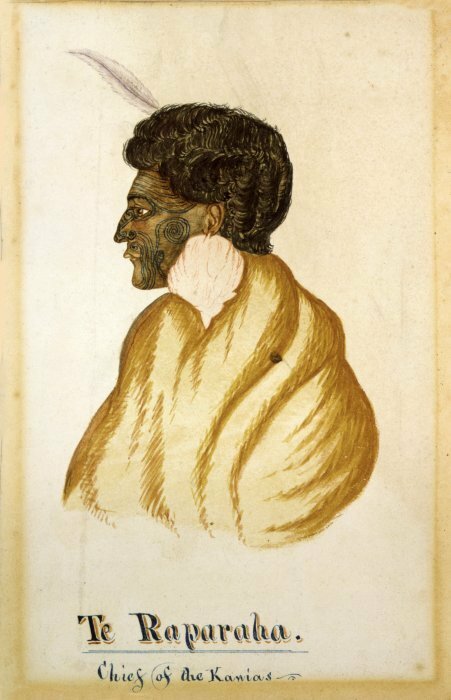 Te Rauparaha spent the final years of his life at Otaki and died on 27 November 1849. He was first buried near the church called Rangiātea and later re-interred on Kapiti Island. He had a huge impact on tribal events and relationships during the years before the signing of the Treaty of Waitangi. He is also remembered as the author of the haka Ka mate performed by the New Zealand All Black rugby team at the start of all important matches.